Gritty! Funny! It's Honey Beaulieu! Honey Beaulieu, the heroine you always wanted to be! That money would sure help buy the farm Honey needs, and she plans to capture McNitt and claim the bounty. 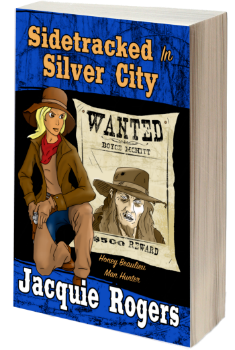 Honey's not about to let the handsome deputy U.S. marshal, an obnoxious ghost, or her own stubborn mule get in her way. Sam's in trouble! Honey's good with a gun but how many men can she best? Don't miss this rollicking ride into the Old West - get your copy of Hot Work in Fry Pan Gulch today! Keep up with the latest news about Honey Beaulieu. All content, including graphics copyright © Jacquie D Rogers 2005-2016, All rights reserved.